Indian Politics Our national time-pass! nobody is perfect, perfumes that smell the best taste the worse. Hitler aur tum me bhi ek similarity hai.. tumhari bhi shaadi nahi hui. Marvi bhai.. I want to help you yaar poor child, like you appeal in your signature. That link only asks for financial help, but what about mental help needed for you poor child? Marvi Pai, how many Jews were there in National Socialists. The spokesman for BJP is Mukhtar Abbas Naqvi (another matter, he is minority ka minorty, i.e. a Shia). Anyways, the Cong has woken up too late on the internet. by the time we see Pro cong posts equalling pro BJP posts, it will be 2019. Yes, it has not increased to the extent expenditures have increased meaning lesser saving. In the name of slump, many organisations have given only minimum growth to employees for last many years..... wht say ? That completes the picture. Basically you are affected by bad growth, over last 5 years. The markets are already rising anticipating Modi and his mere presence (and all the Hype created) will kick off growth. There could be more investment coming in leading to more jobs. And if he works on Infrastructure the Gujarat way, it could be better. Nothing new. It started with the 'Garibi Hatao' Scheme of Indira Gandhi, who put 90% tax on the rich. As Nani Palkhivala said, instead of transferring money from Rich to Poor, it was transferring money from Honest Rich to Dishonest Rich. There were no honest rich left by the time she went out of power. Anyway, it is the reforms started in 1991 which made things better for middle class, particularly those not in govt sector. Modi wants to be continuing those. Plus BJP has a better track record on infrastrcuture. That should help speed things. Brilliant move by Modi.. To have MMS' brother join BJP in Amritsar rally today. NOOO....we do not want that ch! @#$tia in BJP. Unfortunately, he can't do that job even. 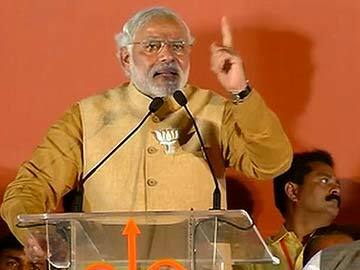 "Modi is a phenomenon which needed to be analyzed properly. But today's (sold out) media failed to do it honestly, future will not forgive them for this mistake"
Last edited by marvelous; April 25th, 2014 at 10:17 PM. One is actually in BJP. It is funny indeed. Marvi Pai, actually such comments were putting me off Modi for a long time. Actually he also made cheap comments some time back like '55 Crore girlfriend'. That was before he officially became the PM candidate. It is only when i checked on his own website that focusses on development, that i am now separating all this nonsense from the man himself. And after all these days, finally he comes out in open against such stuff. Ahmedabad: Narendra Modi today said he disapproved of "petty statements by those claiming to be BJP's well-wishers," without naming Pravin Togadia and Giriraj Singh, whose controversial remarks have embarrassed the BJP in the middle of the national election. In tweets this morning, Mr Modi said, "I disapprove any such irresponsible statement & appeal to those making them to kindly refrain from doing so. Petty statements by those claiming to be BJP's well-wishers are deviating the campaign from the issues of development & good governance (sic)." Modi is smart to stay on issue and not give importance to non-entities and non-issues. What, man? You always make it sound like Modi ji is the eleventh avatar. The man left his wife: no divorce, no alimony, no nothing. Just tata, goodbye, fend for yourself, baby. In the poll affidavits, you are supposed to fill in your spouse's assets too. All this while he was BS'ing, leaving that column empty. For the first time, in the LS poll affidavit, he remembers he is married and mentions her name in that column. All this while he was pretending to be single. How come you got no problem with this? It was a child marriage, not legally valid or recognizable. Nothing that he can be held liable or responsible for. Morally, it's a gray area; to each his own. All times are GMT -7. The time now is 11:50 PM.